Photo used courtesy of Cline Cellars winery. The fires started after a period with very little rain dried out the grasses on the hillsides. CBC News reports that “hardly any measurable rain has fallen in the region over the past six months.” The new conditions may be due to climate change. 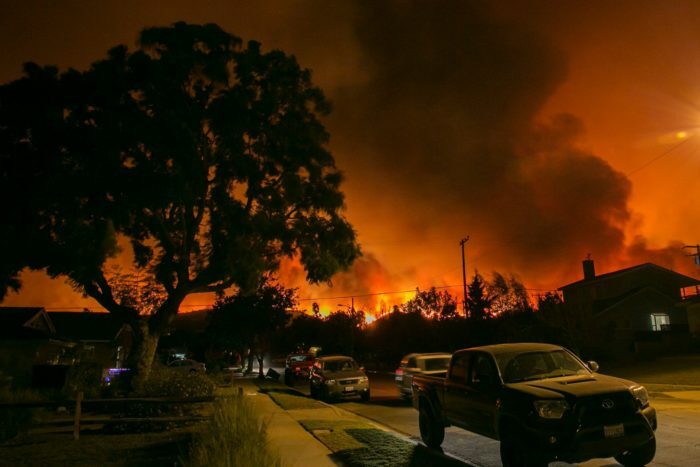 Californians were warned about the fires so they could leave in time. A variety of methods were used to warn residents, including texts sent to their cell phones. The timely warnings have saved lives, giving tens of thousands of residents time to evacuate their homes. The fires have been spread by heavy winds. Many people took their valuables and left in their cars, to escape the shifting fires. 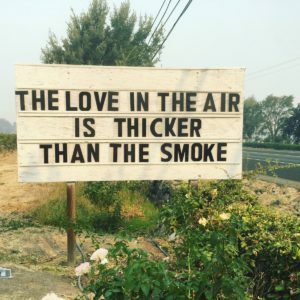 Some people have been able to return to their homes, but many find that the air is too smoky to breathe, so they will have to wait until the fires die down and the air clears, to return home. The local governments are giving masks to residents, to help them breathe more easily. Many people are helping to fight the fires, including pilots who fly planes over the fires and drop water on them. As well, nearly 4,000 inmates (people who have gone to prison for less serious crimes and are considered to require the lowest security) have volunteered to help fight the fires and clear brush. The inmates who volunteer must pass a physical fitness test and then undergo two weeks of training in fighting fires. They are supervised by “professional fire captains,” according to CNN News. Why else do you think an inmate might volunteer to help fight California’s fires? Do you think this is a good idea or a bad idea–or a bit of both? List your reasons. Today’s article tells the story of cause and effect, i.e. California wild fires and the great effort to put them by thousands to put them out. Where else have you read a text that tells of cause and effect? Identify a variety of organizational patterns in a range of texts and explain how they help readers understand the texts (OME, Reading: 2.2). Analyse increasingly complex texts to identify organizational patterns used in them and explain how the patterns help communicate meaning (OME, Reading: 2.2).